A shootout taking place at the Union Station railroad depot in Kansas City, Missouri on June 17, 1933, this gun battle occurred when a gang led by Vernon Miller attempted to free Frank “Jelly” Nash, a federal prisoner. 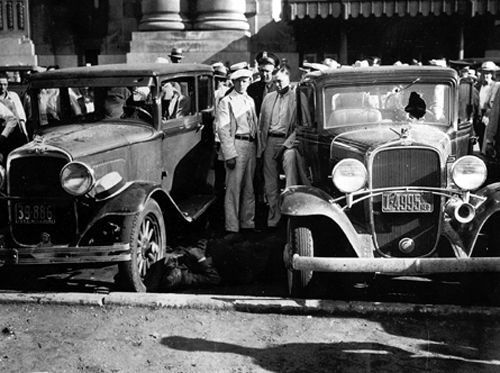 The Kansas City Massacre shocked the American public into a new consciousness of the serious crime problems in the Nation. The killings, which took the lives of four peace officers and their prisoner, involved the attempt by Charles Arthur “Pretty Boy” Floyd, Vernon Miller and Adam Richetti to free their friend, Frank Nash. At the time, Nash was in the custody of several law enforcement officers who were returning him to the U.S. Penitentiary at Leavenworth, Kansas, from which he had escaped on October 19, 1930. Nash’s criminal record reached back to 1913 when he was sentenced to life at the State Penitentiary in McAlester, Oklahoma, for murder. He was later pardoned. In 1920, he was given a 25-year sentence at the same penitentiary for burglary with explosives, and again, was later pardoned. On March 3, 1924, Nash began a 25-year sentence at the U.S. Penitentiary at Leavenworth for assaulting a mail custodian but he escaped on October 19, 1930. The Federal Bureau of Investigation (FBI) launched an intensive search for Nash which extended over the entire United States and parts of Canada. 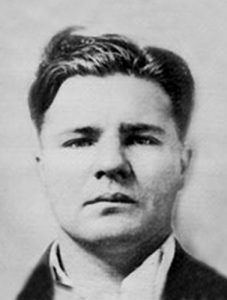 Evidence gathered by the FBI indicated that Nash had assisted in the escape of seven prisoners from the U.S. Penitentiary at Leavenworth on December 11, 1931. The investigation also disclosed Nash’s close association with Francis L. Keating, Thomas Holden and several other well-known gunmen who had participated in a number of bank robberies throughout the Midwest. Keating and Holden were apprehended by FBI Agents on July 7, 1932, at Kansas City, Missouri. Information gained by the FBI as a result of the apprehension of these two indicated that Nash was receiving protection from his underworld contacts in Hot Springs, Arkansas. Based on this information, two FBI Agents, Frank Smith, and F. Joseph Lackey and McAlester, Oklahoma Police Chief Otto Reed located and apprehended Nash on June 16, 1933, in a store in Hot Springs, Arkansas. The law officers then drove Nash to Fort Smith, Arkansas, where at 8:30 that night, they boarded a Missouri Pacific train bound for Kansas City, Missouri. It was due to arrive there at 7:15 a.m. on June 17th. Before leaving, the lawmen made arrangements for R.E. Vetterli, Special Agent in Charge of the FBI’s Kansas City Office to meet them at the train station. Meanwhile, a number of outlaw friends of Nash had heard of his capture in Hot Springs. They learned the time of the scheduled arrival of Nash and his captors in Kansas City and made plans to free him. The scheme was conceived and engineered by Richard Tallman Galatas, Herbert Farmer, “Doc” Louis Stacci, and Frank B. Mulloy. Vernon Miller was designated to free Nash, and while at Mulloy’s tavern in Kansas City, he made a number of phone calls for assistance in the scheme. At about this time, two gunmen, “Pretty Boy” Floyd and Adam Richetti, arrived in Kansas City, and they agreed to aid in the mission. On their way to Kansas City, Floyd and Richetti had been detained at Bolivar, Missouri, early on the morning of the 16th, when their car broke down. While the two were waiting in a local garage for the necessary repairs, Sheriff Jack Killingsworth entered the building. Richetti, who immediately recognized the Sheriff, seized a machine gun and held the Sheriff and the garage attendants against the wall. Floyd drew two .45 caliber automatic pistols and ordered them to remain motionless. Floyd and Richetti then transferred their arsenal into another automobile and ordered the Sheriff in with them. The two gangsters, along with their prisoner, then drove to Deepwater, Missouri, abandoned that car and commandeered another. After releasing the Sheriff, they arrived in Kansas City about 10:00 p.m. on June 16th. There, Floyd and Richetti abandoned the car and stole another before meeting up with met Vernon Miller, who they went with him to his home. After arriving, Miller told them of his plan to free Frank Nash and Floyd and Richetti agreed to help. Early the next morning Miller, Floyd, and Richetti drove to the Union Railway Station where they took up their positions to await the arrival of Nash and the authorities. When the train arrived in Kansas City, Agent F. Joseph Lackey went to the loading platform, leaving Agent Frank Smith, Chief Otto Reed, and Nash in a stateroom of the train. On the platform, he was met by Special Agent Vetterli, who was accompanied by FBI Agent R.J. Caffrey and Officers W.J. Grooms and Frank Hermanson of the Kansas City Police Department. These men surveyed the area surrounding the platform and saw nothing that aroused their suspicion. 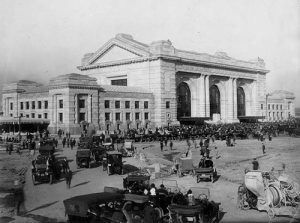 Vetterli then advised Agent Lackey that he and Caffrey had brought two cars to Union Station and that the cars were parked immediately outside. Agent Lackey then returned to the train and, accompanied by Chief Reed, Agents Vetterli, Caffrey, and Smith, and Officers Hermanson and Grooms proceeded from the train through the lobby of Union Station. At the time, both Agent Lackey and Chief Reed were armed with shotguns, while the other officers carried pistols while escorting Frank Nash. Upon leaving Union Station, the lawmen, with their captive, paused briefly; and, again seeing nothing that aroused their suspicion, they proceeded to Caffrey’s car which was parked directly in front of the east entrance of Union Station. As the agents and their captive began to climb into the cars, Agent Lackey noticed a green Plymouth parked about six feet away and two armed men approaching from behind the car. At least one of them had a machine gun. Before Lackey had a chance to warn his fellow officers, one of the gunmen shouted, “Up, up!” as a third man with a machine gun began to approach. Special Agent in Charge, Vetterli turned just in time to hear a voice commanding, “Let ’em have it!” At this point, from a distance approximately 15 feet, an individual crouched behind the radiator of another car opened fire. Officers Grooms and Hermanson immediately fell to the ground dead. Vetterli, who was standing beside Office Grooms and Hermanson, was shot in the left arm and also dropped to the ground. As Vetterli scrambled to take cover, Caffrey was fatally shot in the head. Already inside the car, Frank Nash and Chief Reed were killed by bullets from the gangster’s guns. Agents Lackey and Smith were able to survive the massacre by falling forward in the back seat of their vehicle. Lackey was struck and seriously wounded by three bullets. Smith was unscathed. The three gunmen rushed to the lawmen’s car and looked inside, with one of them shouting “They’re all dead. Let’s get out of here.” With that, they raced toward a dark-colored Chevrolet. Just then, a Kansas City policeman emerged from Union Station and began firing in the direction of the killers. One of them, later identified as Floyd, slumped briefly but continued to run. The gangsters then scrambled into the car, sped westward out of the parking area, and disappeared.